"So this is one of the items, to learn how to decorate the Deity, sri-vigraha. Sri means goddess of fortune, Laksmi. Krsna is always associated with Laksmi. 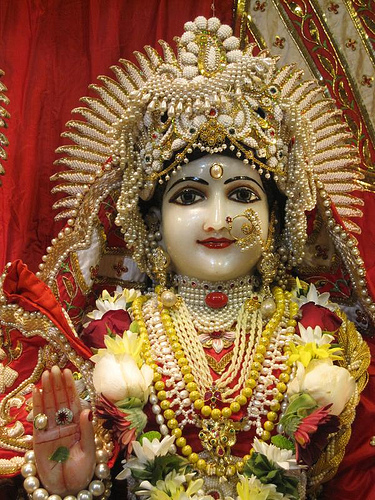 Srimati Radharani is the original goddess of fortune, and as all other Visnu-murti, Nara... Ramadi-murtisu kala-niyamena tisthan [Bs. 5.39]. Krsna is always existing -- tisthan means existing -- with many other forms simultaneously: Rama, Nrsimha, Varaha and Narayana, Visnu. So Visnu and Narayana is... There are many expansion. You have seen on the cover of Srimad-Bhagavatam. There are different planets, and each and every planet there is the predominating Deity, Narayana, Visnu. They have got different names. So He is always associated with His eternal consort as well as devotees, many thousand, millions, in the spiritual world."